On 8 June 2013, members of our Sustainable Agriculture class (part of the Master of Science Degree Programme in Environmental Governance at the United Nations University Institute of Advanced Studies), together with our lecturer Dr. Raquel Moreno-Peñaranda, drove two hours along highways across Tokyo to our destination: the Uozumi family’s agroecological “teikei” farm in Ibaraki prefecture. Surrounded by mountains and fields and bathed in early summer sunlight, this is a small farm of three hectares consisting of the family residence, a greenhouse, an orchard, a chicken house and an adjacent rice paddy, with a vegetable field nearby. The farmer, Mr. Michio Uozumi, together with his wife Michiko, has been cultivating crops and raising animals using exclusively agroecological methods (that is, without using any kind of agrochemicals such as fertilizers or herbicides) for over four decades. 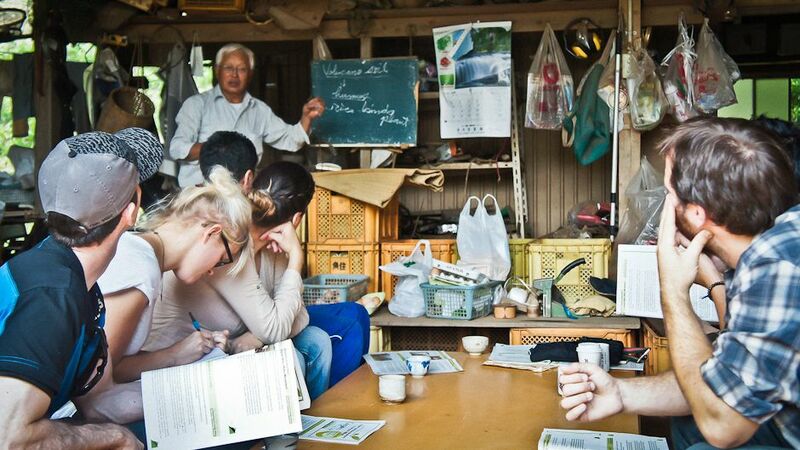 Mr. Uozumi is currently the Vice-President of the Japanese Organic Agriculture Association (JOAA), which advocates using an agroecological approach to farming, and started the Teikei movement in the early 1970s, the Japanese version of community-supported agriculture. Agroecology implies going beyond the standards of certified organic agriculture, which have gained increasing attention regarding their true contribution to the sustainability of agriculture, as they allow for practices such as monocultures or the use of organic inputs purchased in distant markets. In contrast, just as thousands of other agroecologial farmers around the world, the Uozumi family work hand in hand with the ecological processes of nature to create a productive, diverse and resilient agroecosystem on their small farm with their local resources and their farming talent. The teikei system, which emphasizes the co-partnership between consumers and producers, is the natural companion of the agroecological way of farming. In teikei consumers participate in the production through labour and capital, and in return they get seasonal, local, organic food directly from the farm. According to JOAA, a teikei farm usually provides products for 30 to 100 local families. Mr. Uozumi and his wife graduated from the Tokyo University of Agriculture and decided to put their passion for organic agriculture into action. Hence they left their office and city life, and settled on this rural farm with their children. Interestingly, the family manages farming without hiring labourers. Instead, teikei members help out from time to time on a voluntary basis. When it comes time to harvest, the family “summons” its consumers to the farm for assistance. Through such an event, the consumers contribute their labour, interact with producers and share the joy of the harvest. Uozumi family agroecological teikei farm. Photo by Raquel Moreno-Peñaranda. The family welcomed us with fragrant green tea and a vivid lecture, in which Mr. Uozumi introduced JOAA’s efforts to tackle radioactive contamination in the soil after the Great East Japan Earthquake and subsequent tsunami of March 2011, which resulted in a massive release of radioactive materials from the damaged Fukushima Dai-ichi Nuclear Power Plant. Uozumi’s farm is located 130 kilometers from the plant, thus beyond the 30-kilometer exclusion zone. Yet, as with all other farms in the area, the accident contaminated the soil on his farm with radioactive cesium-134 and cesium-137. Fortunately, the levels of radiation were well below the safety levels. Under the Japanese Food Sanitation Law, 5,000 Becquerel per kilogram (Bq/kg) of cesium is considered the safe limit in soil (cesium-137 makes up about half of total radioactive cesium, and therefore its safe limit is 2,500 Bq/kg). Soil tests on 15 of Mr. Uozumi’s farm fields revealed that the average total cesium was approximately 175 Bq/kg (the average in Japan prior to the nuclear disaster was 25 Bq/kg). Mr. Uozumi explained to us how the amount of contamination in the soil does not transfer entirely to the vegetables grown. Also, contamination safety levels of food differ from soil safety levels. In Japan, the prescribed safety level for radioactive cesium in vegetables is 500 Bq/kg. Mr. Uozumi conducted tests growing crops and found that the amount of cesium transferred to the crops varied, as different vegetables absorb different amounts of radiation. These tests are only in their infancy and it is not yet possible to derive conclusive results; however, it is the opinion of Mr. Uozumi that the quality of the soil (especially the humus component) is key to the radioactive transfer process. By using compost mainly produced from fallen leaves, chicken droppings and rice bran, as opposed to chemical fertilizers, the cesium level in both soil and crops can drop, because humus (and clay) enhances soil absorption and fixation of radioactive cesium. As a matter of fact, JOAA has been promoting organic farming as a way to cope with radioactive contamination, since rich organic soils provide resilience to radioactive contamination more effectively than conventionally managed soils. Moreover, cooperation between farmers and fishermen in afforestation activities in coastal mountains aiming to enhance resource and energy cycles among forests, farms and the ocean promoted by the teikei movement, also contributes to the strengthening of the overall sustainability and resilience of farming systems. After the lecture, Mr. Uozumi guided us around nearby farm facilities. He showed us the rice paddy first, where they use traditional rice varieties from seeds managed by the family, and which is irrigated by a natural stream. Following his explanation, we noticed that water in his organic field looked a little muddy, and a few weeds and aquatic animals could be spotted. 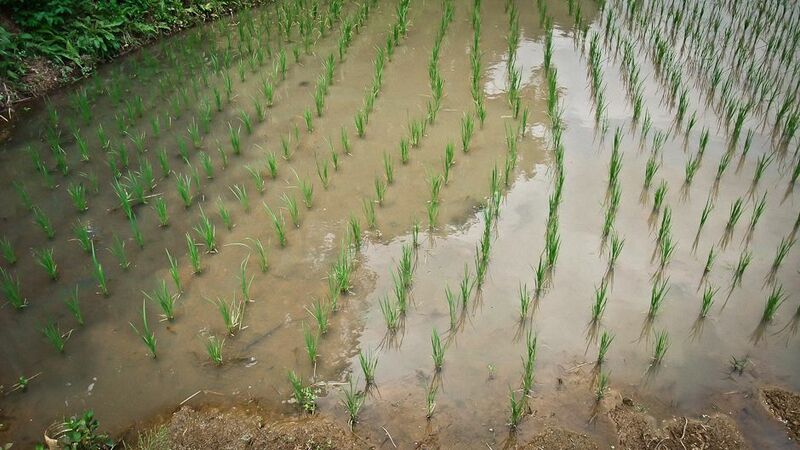 The neighbouring rice paddy, on the other hand, which used agrochemicals, looked immaculately clean, indicating a lack of biodiversity. Mr. Uozumi used to implement the rice-fish model with the help of his fisherman friend. However, this year he was not able to get any fish because his friend retired. This change reminded us of the impact of aging in rural Japan, which accounts for underused agricultural land in many satoyama sites. Uozumi family agroecological teikei farm. Photo by Kahoru Kanari. Next, our trip brought us to the chicken house, where we saw the compost bed and ingredients for the feed. Mr. Uozumi especially emphasized that the feed was GMO-free, traditional and balanced in nutrition, thus ensuring the health of the chickens as well as the quality of the eggs, which are not only consumed by the 100 consumer families, but also by a few victims of the 3-11 earthquake to whom he provides eggs every week for free. He also described in detail how he recycles materials between the poultry and field. For example, the chicken house has a soil floor, and every week the soil, mixed with chicken dropping, is collected for compost. After an exciting morning full of new experiences, we were welcomed with more Japanese hospitality and were offered a delicious, healthy, organic lunch kindly prepared by Mr. Uozumi and his wife. All ingredients came from their farm: the rice, lettuce, onions, eggs, broccoli and homemade mayonnaise. Coming from the city, the food on the farm seemed tastier and fresher than anything in Tokyo. 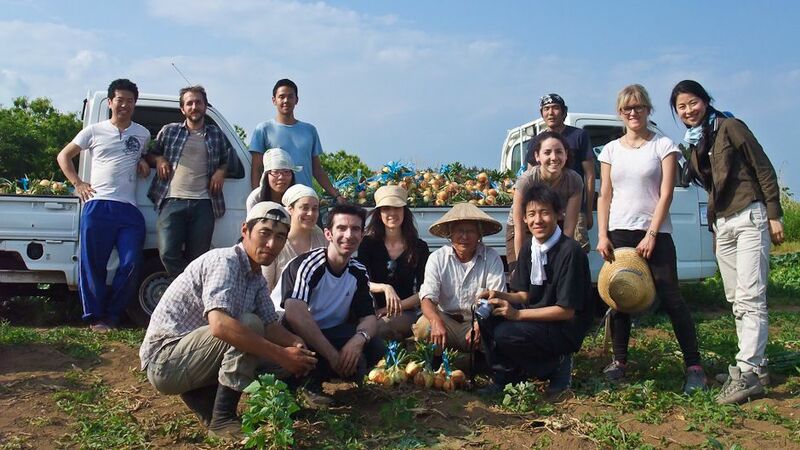 Full of energy from the copious yummy food, we went with Mr. Uozumi, his wife, his son-in-law and two interns visiting that day from Saitama University, to the nearby field where onions were ready to be harvested. The onion seeds were planted in September, so they took around nine months to grow. We were taught how to pull them out correctly, and how to make bundles with four or five onions. 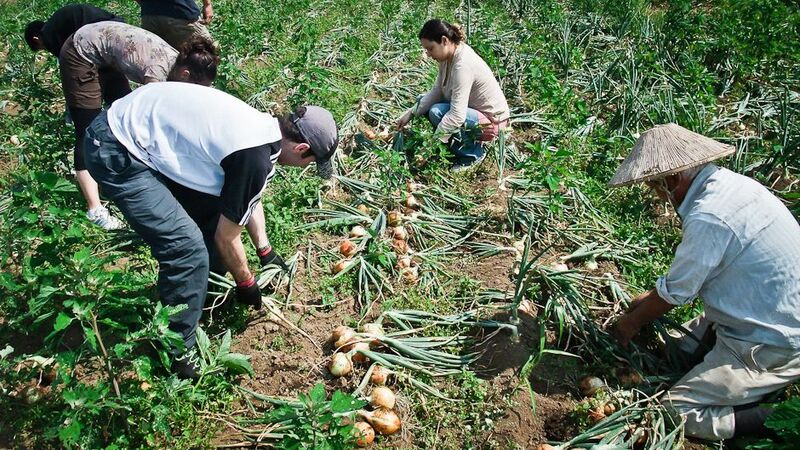 After some time of good work, the group was organized making human chains in order to hang the onions in a nearby shed where they were to be stored. To launch an expanded photo gallery from this field trip click on the banner photo at the top of the page. This field visit was part of the Sustainable Agriculture course of the UNU-IAS Master Degree Programme in Environmental Governance with Specialization in Biodiversity. The Sustainable Agriculture course is taught by Dr. Raquel Moreno-Peñaranda, a Research Fellow at the UNU Institute of Advanced Studies, Operating Unit Ishikawa/Kanazawa and instructer in the UNU-IAS Master in Science in Environmental Governance Programme. Her work focuses on sustainable natural resources management, especially in agricultural systems, looking at the linkages between sustainability and well-being in urban and rural settings. She has carried out extensive consultancy and advisory roles and research coordination for several local and sub-national governments, international environmental NGOs, civil society organizations and multilateral development institutions. A native of Spain, where she graduated in Biology and obtained an MSc in Environmental Analysis, Raquel earned a PhD in Energy and Resources from the University of California, Berkeley. Field Trip to an Agroecological “teikei” Family Farm by John McGlinchey is licensed under a Creative Commons Attribution-NonCommercial-ShareAlike 3.0 Unported License. John McGlinchey is a master’s student at the United Nations University Institute for Sustainability and Peace located in Tokyo, Japan. Having lived and worked in the corporate world in Japan for over 10 years, John decided to change career direction with more of a focus on sustainability by joining the UNU Sustainability, Development, and Peace programme in 2012. He has a general interest in many aspects of sustainability but with a focus on energy. Ye Xu is originally from China, but has been in Tokyo since April 2011. After she finished a Japanese course at the Tokyo School of Japanese Language, she joined the UNU-IAS master’s programme in Environmental Governance. Her academic background is in 18th century culture with a specialization in literature. However, she decided to leave the world of novels for awhile and join the fight for Mother Nature in the real world. I’ve heard about places like this in Japan, but have never seen pictures. Thanks for documenting your experience.